GeoComfort units are made in America with the highest standards of quality. Our commitment to continuous improvement and quality control has made reliability one of the GeoComfort brand’s greatest assets. No other geothermal manufacturer has quality testing as extensive. In fact, each and every GeoComfort unit undergoes rigorous testing before it is packaged for shipping. 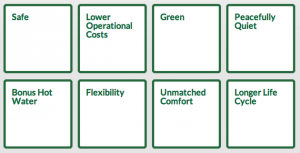 Our specialized component selection and advanced design gives GeoComfort systems a competitive advantage. Unit for unit, GeoComfort systems have higher heating capacities than our competitors. That means less reliance on supplemental heat and ultimately lower heating costs when compared with other geothermal brands. In addition to the highest heating capacities, GeoComfort also boasts the best heating efficiencies. With an average of 4.62 across the product line, and a staggering 4.8 COP (Compass Series XT036) that has raised the bar within the geothermal he at pump industry. The GeoComfort brand offers the broadest residential product offering available. There is a GeoComfort model to meet the needs of virtually any home in any climate. 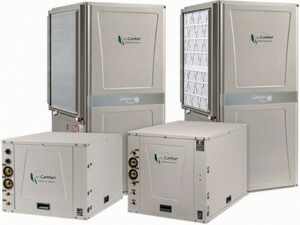 GeoComfort split systems have AHRI certified air handler matches for every model. This means better performance and guarantees the operating efficiency of the system. Efficiency is a critical requirement for many rebate and incentive programs. Hybrid heating situations are possible with GeoComfort split systems. In combination with a new or existing natural gas/oil/propane furnace, the split system will provide all of the air conditioning for the home, as well as 80 – 90% of the heating requirements. The system will switch over to the furnace in extreme cold temperatures for the remainder of the time, providing optimum comfort and efficiency. GeoComfort units come equipped with an oversized, copper rifled coaxial water heat exchanger, providing significantly higher efficiencies than required by the ENERGY STAR program. In addition to life spans far exceeding that of conventional systems, unlike some competitive geothermal systems, all of our units have coated air coils, preventing corrosion for longer life and reliability. ECM blower motors are standard on all GeoComfort equipment. These variable speed motors ensure quiet start up and operate at a fraction of the cost of a conventional blower motor. GeoComfort systems give you more. Hot water generators are standard with all GeoComfort geothermal units which allow you to capture unused heat and apply it to water heating, typically cutting hot water costs by 50 – 60%.